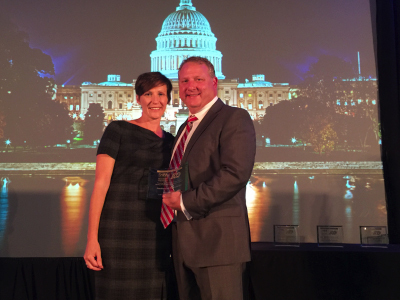 LEAWOOD, KS (September 21, 2015) – CARSTAR Auto Body Repair Experts would like to congratulate Kerry Woodson and Toni Donius, owners of CARSTAR Jungerman in St. Peters, MO, for being named Franchisee of the Year by the International Franchise Association. The purpose of the IFA Awards Program is to provide recognition to those individuals and organizations that have contributed to the growth and success of franchising as a method of distribution in the global economy. With such recognition it is hoped that others will be inspired to emulate those honored and thereby make franchising even more successful in the years to come. Hopefully the resulting publicity will help inform and educate the general public about franchising as a concept, highlighting its benefits to society as a whole. Donius and Woodson are second generation body shop owners. Their parents started Jungerman CARSTAR in 1991, and turned the shop over to the brother and sister when they retired. The siblings have been around the business since it opened. There is a great family atmosphere, and they truly do go above and beyond for their customers. Just last year, CARSTAR Jungerman went green with the addition of solar panels on the roof of their shop. Donius says that it has cut their utility bills by 50 percent. They have also completed an extensive remodeling both inside and out with new paint, new furniture, a new layout, and a newly designed car rental counter to better service their customers. When it comes to their customer service, the proof is in the numbers. CARSTAR Jungerman was recently recognized by Mitchell, an industry leader in shop estimating, management and workflow solutions, as a recipient of the AutocheX™ Solution Premier Achiever Award for consistently having the highest customer satisfaction scores. Earlier this year, CARSTAR Jungerman was also awarded the top honor in the CARSTAR system as Franchisee of the Year.